So then, when I came across this prawn ball recipe, I almost turned the page immediately, but then the word ‘blender’ caught my eye and I stopped to examine the steps. That’s right. The magic word was there and that makes a world of a difference. No arm strength required, just a pulse and a blend to get the paste right. Why not give it a go? I’m not trying to make it sound a lot easier than it is. I am personally surprised by how easy it really is to make these prawn balls. Given that the most time-consuming step is to peel the prawn shells off the flesh, I really don’t think there’s any excuse for myself not to do this. 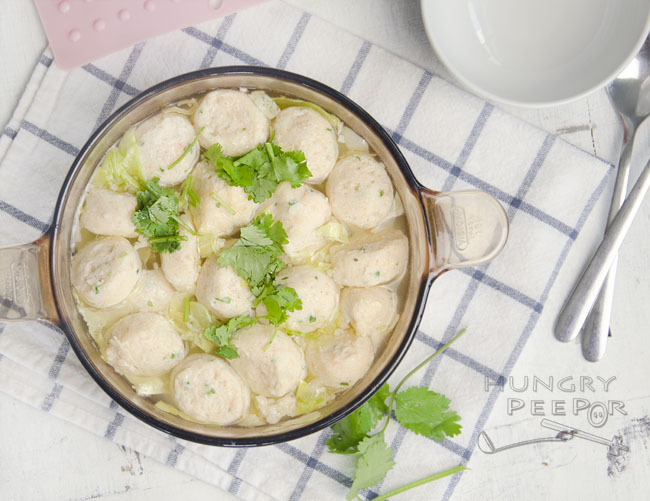 And the good thing is that you could freeze the cooked balls for future consumption so one could also consider making a huge batch of these for storage too. And they are really tasty – so much better and tastier than any other prawn balls sold commercially! Blend prawns and bean curd until a smooth paste forms. Add in spring onion and 1 sprig coriander, 1/2 tbsp white pepper, corn flour and 1 tbsp light soy sauce. Blend to combine evenly. Scoop paste into a piping bag. Leave to chill in fridge until you are ready to cook the soup. Heat oil in pan. Fry garlic until it starts to brown. Add 2 tbsp soy sauce, chicken stock cubes, 1 tbsp white pepper and water. Bring to a boil. Bring soup back to a simmer. Cut the piping bag at the bottom to give a 2cm hole. Slowly push the mixture out of the bag, using a pair of scissors to cut off the mixture to form balls about 2cm in diameters and allowing them to drop gently into the saucepan of water. Continue until all the prawn mixture is used up. Cook the balls for 1min. Add cabbage into the soup. Continue cooking for 2min before turning the heat off. Garnish with remaining coriander before serving. Ensure that the paste is blended fine and smooth, otherwise the balls may break up easily in the soup. Turn the heat down to let the soup simmer while you cut the prawn paste into it. Otherwise, the prawn balls might break up easily if you leave the water boiling as this would result in the balls rolling around vigorously. You could try to use your hand and a spoon to scoop the prawn paste into balls, which is the traditional way of making fresh balls by the professional hawkers. I wasn’t confident of doing so and decided to use this trick instead. It worked really well and was such a convenient of making these balls without creating a mess at home! 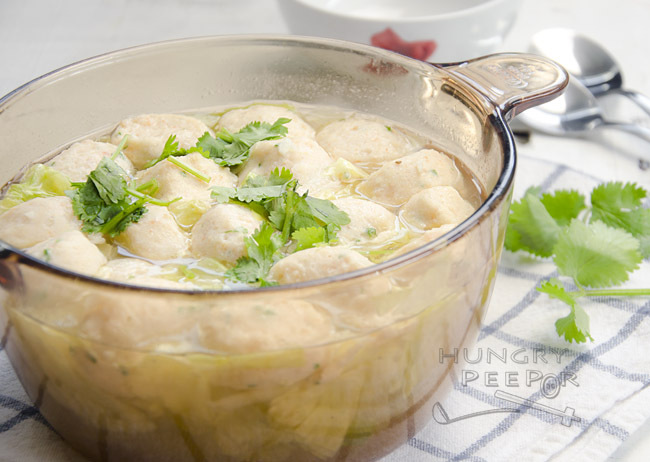 This recipe was kindly adapted from Quentin Pereira’s Eurasian Heritage Cooking. 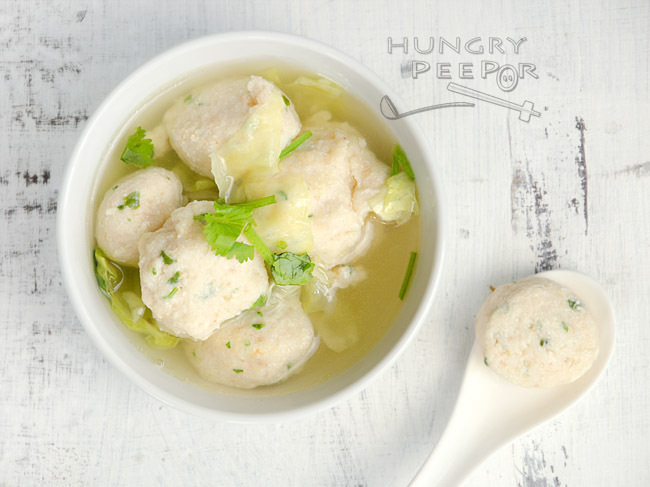 This entry was posted in Eurasian, Soup and tagged Blended, Boiled, Prawn, Prawn ball, Seafood. Bookmark the permalink.